In the fall 2012 semester, graduate students in Prof. Corey D’Augustine’s course, Introduction to Painting Conservation, learned about tempera paintings by making their own on wood panels with gold leaf. Their images were inspired by work at The Metropolitan. 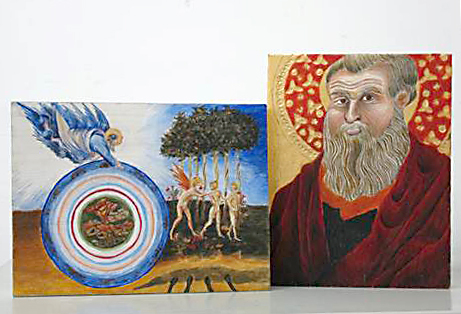 Here are two examples of completed paintings by Sarah Szabo, on the left, and Amelia Catalano, on the right. If this is the Amelia Catalano I know of from the 90’s, she’s always been an incredibly talented artist.